Deus Ex: Human Revolution and Warhammer 40000: Space Marine are both good games, but in completely different ways, which I will attempt to explain here. Deus Ex: Human Revolution takes place in the near future, when cybernetic technology is really starting to take off. 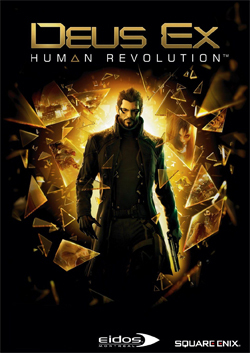 Adam Jensen is the head of security for Sarif Industries, a cybernetics corporation that has breathed new life into a Detroit ravaged by the collapse of the auto industry and the demise of oil as a viable fuel source. Sarif Industries HQ is attacked by several cybernetically-augmented mercenaries, their star research team (including Adam's fiancée) is killed, and Adam is very nearly killed. At the insistence of David Sarif, Adam is extensively rebuilt with cybernetic technology. The game is centered around the search for the people behind the attack. Like its famous predecessor, Deus Ex, Human Revolution is quite a bit different from most other games. One of the most striking differences is in the control scheme. By default, "take cover behind the object in front of you" is bound to the right mouse button. This is because this action is very important in this game, and not just to avoid enemy fire. Human Revolution is not billed as a stealth game, but it really is. Trying to "run and gun" will end very badly for Mr. Jensen. Avoiding detection is essential. There are also quite a few options for interacting with the environment. For example, automated turrets and security bots can be hacked, allowing them to be shut down or turned against their former allies. Quite a bit of clutter can be picked up, repositioned, or thrown at enemies, especially after obtaining the strength upgrade. All this combines to make gameplay pretty fluid. There are usually several ways to handle any given situation, and it's fairly easy to make Adam carry out whatever plan you've concocted. There are a wide variety of cybernetic upgrades Adam can obtain over the course of the game, some more useful than others. Some improve his stealth capabilities (like the absolutely indispensable cloaking device), while others improve his offensive capabilities (like the Typhoon system, which destroys everything near him). Others make hacking easier or provide resistance to environmental hazards. Unlike in the original Deus Ex, there are no weapon-specific upgrades; Adam can use any weapon effectively from the start. Some people think this makes the game a shooter with RPG elements instead of an RPG with shooter elements, but I think it makes sense. After all, Adam is a former SWAT officer. It would be a bit strange if he was no good at handling an assault rifle. My primary gripes with Human Revolution are Adam's behavior in cutscenes and the ending. The decision to expand on Adam's character in pre-rendered cutscenes needed to be handled delicately, since in-game conversations gives the player ample opportunity to do so, and if the two come into conflict, the player feels like the man in the cutscenes is a different character. In my case, it seemed that Mr. Jensen lost about 50 IQ points in the cutscenes, falling for really stupid traps and generally being unaware of his surroundings. Since these pre-rendered cutscenes are pretty rare, this isn't too big an issue. In fact, they're more like comical intermissions than exposition. My gripe with the ending is this: at the end of the game, the player is presented with four buttons. These are the only things that have any bearing on the ending whatsoever. It's a bit anticlimactic, but after suffering through the massive WTF that was Mass Effect 3's ending, it doesn't really bother me that much. Plus, the four endings are fairly different from each other, unlike Mass Effect 3. Ugh. Just thinking about Mass Effect 3's horrible ending pisses me off. By contrast, the biggest problem with Human Revolution's endings in and of themselves is that the moralizing is a bit heavy-handed. Again, not a huge issue. In conclusion, Deus Ex: Human Revolution is an excellent game, and I wholeheartedly recommend it. Warhammer 40000: Space Marine takes place in the grim, distant future of the Warhammer 40000 tabletop games. Humanity is spread across the stars and beset on all sides by a variety of violent aliens such as the brutish Orks, the monstrous Tyrannids, and the vile Necrons. As if that weren't bad enough, the forces of Chaos residing in the alternate reality known as the Warp constantly plot against us. While Mankind has very advanced technology, the knowledge of how to use it is limited, and engineering involves religious rituals. In fact, nearly everything involves religious rituals, as Mankind lives under a rather rigid and intolerant theocracy revolving around worship of the Emperor, a man of immense psychic power who founded the Imperium of Man. Ironically, the Emperor, nearly comatose in an elaborate life-support device, is horrified by this. Unfortunately for Mankind, the theocracy is definitely the least of the many evils they face. 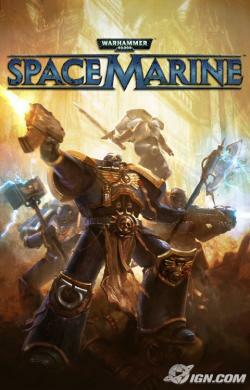 The mightiest forces Mankind has to fight back are the superhuman Space Marines. Space Marine puts the player in the boots of Captain Titus of the Ultramarines, the mightiest of the Space Marine chapters. Captain Titus is sent to an industrial world to hold the line against a massive Ork invasion until a liberation fleet can arrive. As such, the battles involve wading through hordes of Orks. The control scheme places quite a bit of emphasis on melee combat, and for good reason: the melee weapons are the most effective way to deal with the swarms. The damage system reflects this, too. Titus has a regenerating shield and non-regenerating health. To regain health, he has to stun an enemy and then perform a brutal "execution" move on them. The ranged weapons are most useful in special situations, like when enemies are perched on high ledges. My biggest gripe about the game is the difficulty curve. It starts out OK, but later in the game, it REALLY ramps up. I played on the easiest difficulty setting, and there were several sections that took me many attempts to get past. I'm pretty sure my attempt count went into the double digits on at least one of them. My second-biggest gripe is the final boss fight. It's a sequence of quick-time events! It ends with a mind-numbingly long sequence of "press left mouse button to punch bad guy in face" followed by "press space bar to dodge counterattack." Yahtzee would throw a fit over this. Personally, I'm just going to call it very jarring and anticlimactic. Overall, I found Space Marine entertaining, and I would recommend it, but only to people with a decent tolerance for violence and gore, since there's a lot of both in this game.